If there is a "Mr. Johnny Rockets" within the Johnny Rockets' system, it's got to be Lloyd Sugarman. A co-founder turned independent franchisee—one of the first to sign on when the 25-year-old chain began franchising—Sugarman lives and breathes the brand and has been one of its most innovative and energetic agents of change. The fact that his units are consistently among the highest grossing within the roughly 300-unit chain speaks to his general business acumen. But Sugarman is also a consummate entrepreneur and idea man who created some of the most recognizable tenets of the Johnny Rockets brand. He was the first, for instance, to stray from the original freestanding all-American diner prototype on which the chain was built and alter it to fit high-volume nontraditional locations without sacrificing iconic brand elements such as malt shop-style counter seating, open kitchens and dining room staffers who break into song and dance. He made regional shopping malls a hot spot for Johnny Rockets, even making the concept work within the confines of mall food courts. Today, 80 percent of Johnny Rockets are located in regional shopping centers. 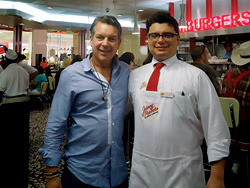 Those singing and dancing staffers that entertain guests in Johnny Rockets across the globe? That's Sugarman's doing, as well. Back in the late '80s, he spotted the talents of a couple of employees who'd come up with a song and dance routine that they occasionally performed for guests. "I loved it and recorded it and that's how it started," Sugarman says. "Ronn (Teitelbaum), the founder of Johnny Rockets came in at lunchtime one day. He rushed in back and said, ‘Lloyd, come out here and look what's going on. They're singing and dancing. It's lunchtime! You've got to get these people in and out.' I asked him to just wait a minute and all of a sudden, when they were done, the place went nuts. Clapping, screaming, He instantly changed his tune." The Sugarman touch has extended to the chain's burger-based menu, as well, most notably with The Streamliner. Responding to a vegetarian friend's comment that he'd like to come to Johnny Rockets but couldn't eat there, Sugarman saw an opportunity to "fix the veto vote." The result, introduced in 1994 and quickly adopted systemwide, is the popular Streamliner, a soy-based burger topped with grilled onions, shredded lettuce, fresh tomato, pickles and mustard. "We're clearly a beef-based concept, but we won an award from PETA for the best vegetarian sandwich of any national chain," he says. While he's made his mark in a variety of ways, Sugarman's latest contribution is the one he's most excited about. On his own dime and facing stiff resistance to change from corporate and fellow franchisees alike, two years ago he commissioned and helped develop a new, updated design prototype for the chain—the first change in its 25-year history. "We didn't want to change our look much because we thought it captured exactly what we were trying to do," says John Fuller, CEO of Johnny Rockets. "But Lloyd came forward with a design that looked really good. We said let's test it in a couple of corporate stores along with Lloyd's stores. They look great and are doing really well. Even other hard-core franchisees who were against it have now come around and are adopting elements of the new design. Lloyd gets all the credit for spearheading that project for us. In this, as in so many other things, he's on the leading edge."